Monday 20th February 2017 marked the most historic declaration of famine in parts of South Sudan, affecting mostly Internally Displaced Persons (IDPs) who are dispersed and the host communities already affected by the on-going conflict. Across South Sudan, more than 3 million people have been forced to flee their homes and nearly 7.5 million people need humanitarian assistance and protection, as a result of multiple and deepening crises, including conflict, inter-communal violence, economic decline, disease, and climatic shocks, which have led to displacement, distress, destitution and death. South Sudan ACT Forum members CA, DCA, FCA, ICCO-Cooperation, LWF, NCA and PRDA are planning to respond jointly. The key response sectors are Food Security & Livelihoods, Nutrition, WASH and NFIs, as well as Education (EiE) & Psychosocial Support. 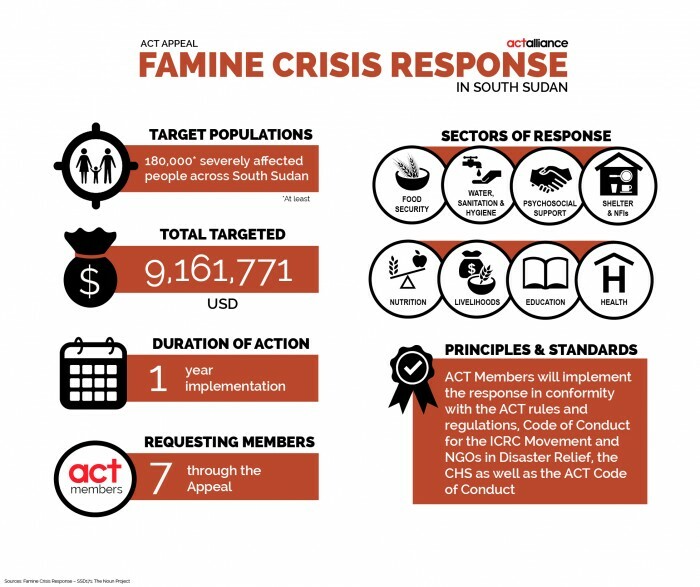 This intervention will be targeting at least 180,000 severely crisis affected people across South Sudan, with a target of 9,161,771.54 USD.